The unrelenting rains of 2013 in southeastern peanut fields created perfect conditions for the rapid development of white mold and rhizoctonia- diseases that can cause plant death. However, disease outbreaks did not occur because peanut growers were vigilant in applying fungicides. “So far, 2013 has been a perfect weather year for peanut diseases in the Deep South: wet with swampy plus short spurts of hot with swampy. But that disease pressure just hasn’t hit yet. “Despite my repeated and dire predictions for severe disease outbreaks this year in our peanut fields, the reports from county agents have been fairly quiet. …I know of very few situations where disease has overwhelmed a (peanut ) crop,” said Bob Kemerait, plant pathologist with the University of Georgia Cooperative Extension. Why have peanut diseases not been so bad? Title: Grower know-how, good fungicides keeping peanut diseases at bay. 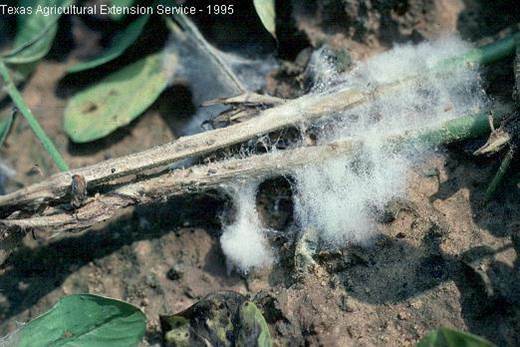 This entry was posted in Fungicides and tagged fungicides, peanut disease, peanut growers, peanuts, plant death, southeastern peanut fields, white mold by pesticide guy. Bookmark the permalink.